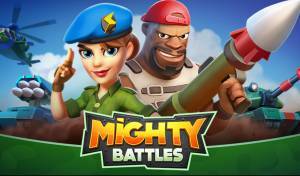 Mighty Battles is a free-to-play 1v1 Multiplayer lane-based arena game that combines battle arena strategy with first-person shooter Gameplay. Your mission is simple, destroy enemy bases and work your way up the rankings. To achieve this though means building a powerful and effective squad from a deck of over 40 cartoon-style cards that depict army units and vehicles such as tanks and helicopters. What is the Main Source of Income during Battles? How do I Reload my Base Gun and use its Scope? How do you Unlock and Upgrade Units? Should I Spend Gold on Opening Crates? How do you Construct the Best Squad? How do you Move Up through the Division Ranks? What is the Daily Battle League Event? No discussions open for Mighty Battles at the moment.